It has been another vintage Bundesliga season, with the number of wisecracks to the cameras off the pitch the only match for the number of goals flying in on the pitch. In that spirit, bundesliga.com has selected some of the season's best, most memorable quotes. "We've dropped two points again today" - Kevin-Prince Boateng after Eintracht Frankfurt lost 1-0 at home to Wolfsburg on Matchday 2. "Well, I'm German" - Hoffenheim's Nico Schulz on if he has any hopes for a Germany call-up. "It was a nice goal, up there with the best I've ever scored" - James Rodriguez on his stunning free-kick against Bayer Leverkusen on Matchday 18. Watch: Sit back and enjoy James' free-kick against Leverkusen in all its glory! "I didn't overreact, I just used a swear word" - Freiburg coach Christian Streich on being sent to the stands in his side's 2-0 defeat to Schalke on Matchday 28. "He looks like a 50-year-old, but plays like he's 28" - Javi Martinez on Bayern third-choice keeper Tom Starke. "I didn't think we'd turn it around. I asked the fourth official after 25 minutes if we could reduce the game to 70 minutes" - Schalke coach Domenico Tedesco after after his side came from four goals down to draw 4-4 at Borussia Dortmund. Watch: Check out the highlights from one of the greatest Dortmund-Schalke meetings ever! "I saw the goal on TV and watched him putting it down. I didn't watch any more because I thought the lads would make sure he left it alone" - Borussia Mönchengladbach coach Dieter Hecking on Christoph Kramer's free-kick against Wolfsburg. "It's actually mad how many goals he scores. I don't think I score as many goals in training as he does in a game" - Sandro Wagner on Cristiano Ronaldo. "If Nils plays from the start, then he can't be brought on. That's a fact" - Streich on supersub Nils Petersen. "My daughter and my wife advised me to do it, and then Cando [his dog] barked twice. That was that, really" - Heynckes on coming out of retirement to save Bayern's season. "Maybe people thought I wasn't going to be playing" - Wagner after Hoffenheim failed to sell out their UEFA Europa League meeting with Braga. "I love black and yellow. Black is Batman, and yellow is Spongebob!" - Borussia Dortmund's Michy Batshuayi on why he joined. "There's not really one that fits my thin biceps. 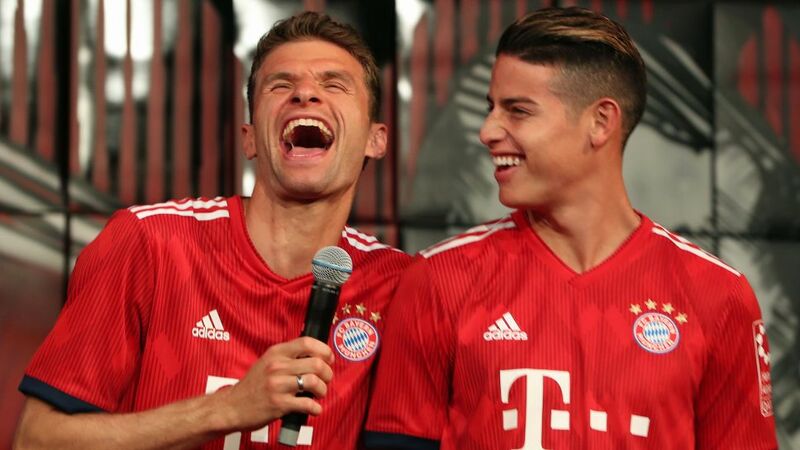 I suppose I'll have to work out a bit more" - Müller on wearing the Bayern armband. "In my eyes I'm the best German striker. And without relying on statistics, as I couldn’t care less about those. To me, it's just important that my performance is up to standard" - Wagner after his first goal back in Bayern colours. "I'd seen the boys go off to celebrate in the corner and they weren't paying attention to the assistant referee. Then I switched off and wanted to go and drink. I think that's the last time I leave my water bottle in my goal" - Duisburg goalkeeper Mark Flekken. "He used his left leg today; normally he just uses that for standing" - Heynckes on Müller's second goal of the season. "After a few beers, definitely" - Schalke's Ralf Fährmann on whether he would sleep that night after an error allowed Werder Bremen to run out 2-1 winners at the Veltins Arena on Matchday 21. "Everyone feels like I'm just kidding around – [that] I'm joking. But I'm serious. I'm actually going back to Dortmund in a couple of weeks to work with them for three more weeks just to assess myself at a better level - to see what level I'm at or what I need to do, or if I can" - Usain Bolt, Dortmund trialist.